Drupal is invariably the best Content management system in the global arena today. It is Receptive, Reliable and Secure. "We don’t just build websites, we build your business." If a content management system like Joomla or WordPress was used in your business, you can have better. Fortunately Drupal 8 is one of the functional and most flexible CMS solutions that are launched recently. Drupal is a content management system that enables you to organize, manage and publish the content with great ease. Drupal is written in PHP. It is a good platform for publishing complex websites, online communities and portals. Besides this, it provides flexibility, modularity and also easy to use even if you don’t have immense programming knowledge. Are you looking for a Drupal website development company in India? If yes, India Internet is one of the best Drupal development company from India that is offering exclusive services regarding Drupal. 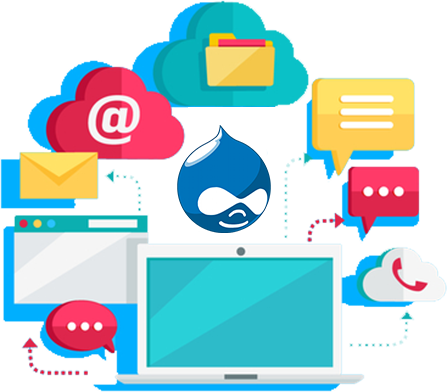 We offer full-cycle Drupal web development services that include consulting and support, creative design, module development and others. Our professionals use a holistic approach and good methodologies for providing you with next generation business website with every desired aspects and seamless performance. We are located in New Delhi with a team of well-trained and experienced Drupal developers to provide effective content management system. Experts at our organization keep themselves updated with the right concepts of several content management systems. At India Internet, you will achieve customized drupal development services to build a strong website along with functional apps. We have expert web developers to use the contemporary trends of Drupal CMS. It is effective for using the latest trends of the CMS for making customized web solution for your company. We have years of experience in Dupal and you will be ensured of high end services at a reasonable price. At India Internet, our Drupal developers will provide you with support throughout the different steps in project lifecycle. It includes planning analysis, pre project analysis, testing, design and development, and post support. Experienced developers at our company provide 100% customized solutions by enhancing performance, decreasing project cost and increasing business value. In the year 2001, Palette Art Gallery was conceptualized and conceived in the capital city of New Delhi, India.